1. Open the iTunes Connect with your account at here. 5. Type in a new tester by adding his/her e-mail address and name or use Import File to add testers from a file. The file must be in .cvs form. 6. External testers will get an invitation email when new beta version is available and will be prompted to install the free TestFlight app from the App Store. Important note: applications made available to external testers require a Beta App Review from Apple. 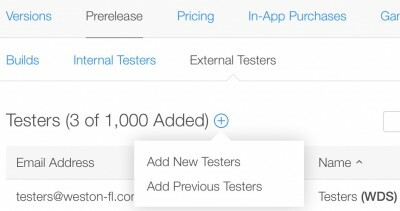 25 members of your internal testers can receive invitation to test any build version without this lengthy beta app review but they have to have assigned Technical or Admin role in iTunes Connect. See iTunes Connect -> Users and Roles.